Today we have a guest post from Lisa, a great Instagram friend, member of my #kidsstickerswap community, and a slimming world guru! 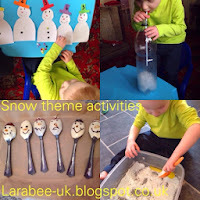 Lisa does the most wonderful activities with her little ones, and she has kindly agreed to share the activities they recently did on their snow themed activities, and what fantastic activities they are too! Hello there folks, my names Lisa. I hope you all had a merry christmas and are all organised for the new year ahead. When I was asked to do this guest post I was thrilled, the theme was perfect and it would kickstart my New Years resolution to do more activities with the kids. But even with all the notice I was given I left it to the last minute! Christmas means chaos here, how could I forget!? And so whilst I browsed the internet for ideas, setting plans in motion was put on the back burner. However finally all the fun and excitement of Christmas died down and I found time to get some of the plans into action (and even get the materials needed - for the most part!) so here we have our snow themed activities which I did with my son Hendrix (aged 3) and daughter Ella (aged 10) and my other son Cailan (aged 1 3/4) also joined in/got in the way! I cut out 5 snowmen from white paper and gave them some awesome snowman features. I then cut out 5 snowman hats from different coloured paper and labelled them 1-5. Next I laid the snowman out for Hendrix and handed him some small coloured buttons. We said the number on the snowman's hat and then Hendrix had to put the corresponding amount of buttons on the snowman. Once the buttons were in place we counted the buttons on each snowman. Although Hendrix can occasionally count to 3 or 4, he can't do it all the time just yet, so this was a fun and simple way to practice number recognition and counting skills. I took an old plastic bottle and removed the label, using a black pen I drew snowmen on the bottle. I pulled apart some cotton wool balls and popped them in the bottle. Next I handed Hendrix a straw and we placed it in the bottle leaving enough out for Hendrix to be able to blow down the straw and make the cotton wool whirl around the bottle. I tried to take a video but it was a massive fail trying to film and hold the bottle in place but I've attempted one nonetheless. Hendrix loved this, he thought it was absolutely amazing that the "snow" moved around and he's gone back to it numerous times for over a day now! Took an old plastic tub, tipped a pot of bicarbonate of soda in it and added shaving foam, mixing it in until it made a nice snowy texture (it really does feel cold to touch!) I added glitter, pom-poms and sequins, and supplied some scoops, spades etc to play with. This was a massive hit! Hendrix loved rolling the snow flat, and then scooping it up which makes it go back to it's powdery state, and because it can be moulded so well, it could be pressed into cookie cutters and other shapes. And the best bit for me (other than the lush smell!) was that any spilled on the floor was easily swept up and any on his clothes came out in the wash. So much fun from just 2 ingredients, will definitely be making this again. I melted some white chocolate on the hob, once done it was over to Ella to do the rest. First she coated the back of 6 plastic spoons in white chocolate. Once the chocolate had set she took some icing pens and decorated them. I think they look brilliant and I would like to say they tasted delicious, sadly I didn't get to try any because the kids grabbed 2 each and they were gone before I'd washed the bowl of melted chocolate! But judging be their reaction I'd say they were yummy! Thanks so much Lisa for your fantastic ideas! I cannot wait to try out all of these, I know that T will love them. We have a pinterest board with lots of winter theme activities, have a follow for more fab ideas. Love these, some really great ideas here which we'll no doubt try out soon. Lisa has spoilt me with such a great post! Love these ideas especially the snowman counting one. I know my little ones would love this, thanks for the inspiration. Hi Clare, Lisa has some great ideas doesn't she! What fab ideas! My children would love all of these. The chocolate snowmen spoons look fantastic. I particularly like those chocolate spoons Karen!